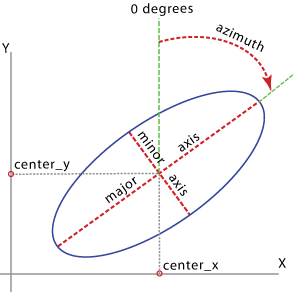 Creates a new feature class containing geodetic ellipse features constructed based on the values in an x-coordinate field, y-coordinate field, major-axis field, minor-axis field, and azimuth field of a table. If you use text files and .csv (comma-separated value) files as input, make sure that they follow the file structure specified in About tabular data sources. Each geodetic ellipse is constructed using a particular set of field values representing the x and y coordinates of a center point, major and minor axis lengths, and azimuth angle measured from North. These fields and values will be included in the output. A geodetic ellipse is a curve on the surface of the earth. However, a geodetic ellipse feature is not stored as a parametric (true) curve in the output, but rather a densified polyline representing the path of the geodetic ellipse. If you specify the same field for both Major Field and Minor Field, or if the values in both fields are equal, then the output features represent geodetic circles. When the output is a feature class in a file geodatabase or a personal geodatabase, the values in the Shape_Length field are always in the units of the output coordinate system specified by the Spatial Reference parameter; and they are the planar lengths of the polylines. To measure a geodesic length or distance, use the ArcMap Measure tool; make sure to choose the Geodesic, Loxodrome, or Great Elliptic option accordingly before taking a measurement. When needed, you can use the Feature To Polygon tool to convert the output polylines to polygons. The input table that can be a text file, CSV file, Excel file, dBASE table, or geodatabase table. The output feature class containing geodetic ellipses as densified polylines. A numerical field in the input table containing the x coordinates (or longitudes) of the center points of ellipses to be positioned in the output coordinate system specified by the spatial_reference parameter. A numerical field in the input table containing the y coordinates (or latitudes) of the center points of ellipses to be positioned in the output coordinate system specified by the spatial_reference parameter. A numerical field in the input table containing major axis lengths of the ellipses. A numerical field in the input table containing minor axis lengths of the ellipses. The units for the values in Major Field and Minor Field. A numerical field in the input table containing azimuth angle values for the major axis rotations of the output ellipses. The values are measured clockwise from North. The units of the values in the Azimuth Field. DEGREES —Values in decimal degrees; this is the default. A field in the input table; this field and the values are included in the output and can be used to join the output features with the records in the input table. By entering the path to a .prj file, such as C:/workspace/watershed.prj. By referencing a feature class or feature dataset whose spatial reference you want to apply, such as C:/workspace/myproject.gdb/landuse/grassland. By defining a spatial reference object prior to using this tool, such as sr = arcpy.SpatialReference("C:/data/Africa/Carthage.prj"), which you then use as the spatial reference parameter. Creates polyline ellipse features from a table.